Injecting minute amounts of two immune-stimulating agents directly into solid tumors in mice was able to eliminate all traces of cancer in the animals — including distant, untreated metastases (spreading cancer locations), according to a study by Stanford University School of Medicine researchers. The researchers believe this new “in situ vaccination” method could serve as a rapid and relatively inexpensive cancer therapy — one that is unlikely to cause the adverse side effects often seen with bodywide immune stimulation. Levy’s method reactivates cancer-specific T cells (a type of white blood cell) by injecting microgram (one-millionth of a gram) amounts of the two agents directly into the tumor site. *** Because the two agents are injected directly into the tumor, only T cells that have infiltrated the tumor are activated. In effect, these T cells are “prescreened” by the body to recognize only cancer-specific proteins. “I don’t think there’s a limit to the type of tumor we could potentially treat, as long as it has been infiltrated by the immune system.” — Ronald Levy, MD. The approach worked “startlingly well” in laboratory mice with transplanted mouse lymphoma tumors in two sites on their bodies, the researchers say. Injecting one tumor site with the two agents caused the regression not just of the treated tumor, but also of the second, untreated tumor. In this way, 87 of 90 mice were cured of the cancer. Although the cancer recurred in three of the mice, the tumors again regressed after a second treatment. The researchers saw similar results in mice bearing breast, colon and melanoma tumors. Finally, researchers explored the specificity of the T cells. 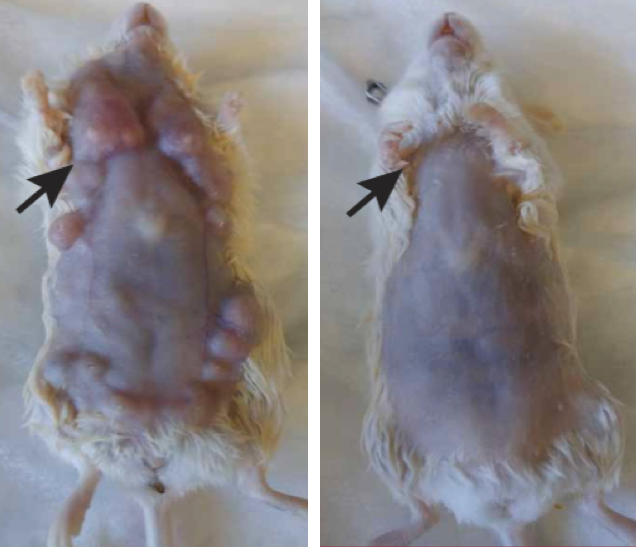 They transplanted two types of tumors into the mice. They transplanted the same lymphoma cancer cells in two locations, and transplanted a colon cancer cell line in a third location. Treatment of one of the lymphoma sites caused the regression of both lymphoma tumors but did not affect the growth of the colon cancer cells. The current clinical trial is expected to recruit about 15 patients with low-grade lymphoma. If successful, Levy believes the treatment could be useful for many tumor types. He envisions a future in which clinicians inject the two agents into solid tumors in humans prior to surgical removal of the cancer. This would prevent recurrence of cancer due to unidentified metastases or lingering cancer cells, or even head off the development of future tumors that arise due to genetic mutations like BRCA1 and 2. * Levy, who holds the Robert K. and Helen K. Summy Professorship in the School of Medicine, is also a member of the Stanford Cancer Institute and Stanford Bio-X. Levy is a pioneer in the field of cancer immunotherapy, in which researchers try to harness the immune system to combat cancer. Research in his laboratory formerly led to the development of rituximab, one of the first monoclonal antibodies approved for use as an anticancer treatment in humans. Professor of radiology Sanjiv Gambhir, MD, PhD, senior author of the paper, is the founder and equity holder in CellSight Inc., which develops and translates multimodality strategies to image cell trafficking and transplantation. The research was supported by the National Institutes of Health, the Leukemia and Lymphoma Society, the Boaz and Varda Dotan Foundation, and the Phil N. Allen Foundation. Stanford’s Department of Medicine also supported the work. ** Some immunotherapy approaches rely on stimulating the immune system throughout the body. Others target naturally occurring checkpoints that limit the anti-cancer activity of immune cells. Still others, like the CAR T-cell therapy recently approved to treat some types of leukemia and lymphomas, require a patient’s immune cells to be removed from the body and genetically engineered to attack the tumor cells. Immune cells like T cells recognize the abnormal proteins often present on cancer cells and infiltrate to attack the tumor. However, as the tumor grows, it often devises ways to suppress the activity of the T cells. *** One agent, CpG, that induces an immune response in a short stretch of DNA called a CpG oligonucleotide, works with other nearby immune cells to amplify the expression of an activating receptor called OX40 on the surface of the T cells. The other agent, an antibody that binds to OX40, activates the T cells to lead the charge against the cancer cells. It has recently become apparent that the immune system can cure cancer. In some of these strategies, the antigen targets are preidentified and therapies are custom-made against these targets. In others, antibodies are used to remove the brakes of the immune system, allowing preexisting T cells to attack cancer cells. We have used another noncustomized approach called in situ vaccination. Immunoenhancing agents are injected locally into one site of tumor, thereby triggering a T cell immune response locally that then attacks cancer throughout the body. We have used a screening strategy in which the same syngeneic tumor is implanted at two separate sites in the body. One tumor is then injected with the test agents, and the resulting immune response is detected by the regression of the distant, untreated tumor. Using this assay, the combination of unmethylated CG–enriched oligodeoxynucleotide (CpG)—a Toll-like receptor 9 (TLR9) ligand—and anti-OX40 antibody provided the most impressive results. TLRs are components of the innate immune system that recognize molecular patterns on pathogens. Low doses of CpG injected into a tumor induce the expression of OX40 on CD4+T cells in the microenvironment in mouse or human tumors. An agonistic anti-OX40 antibody can then trigger a T cell immune response, which is specific to the antigens of the injected tumor. Remarkably, this combination of a TLR ligand and an anti-OX40 antibody can cure multiple types of cancer and prevent spontaneous genetically driven cancers.